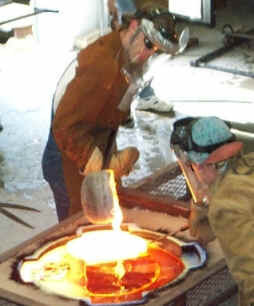 Many of my pieces are cast using a sand mold process that is very similar to traditional metal foundry practices. This green sand is actually a crushed volcanic rock (olivine), that is mixed with a specific percentage of dry clay (bentonite). The bentonite gives this mixture some stickiness so that the pattern can be pressed with greater detail. The green sand is moistened and screened into a metal casting box. Then I press my original pattern (made of wood, plaster or wax) into the sand, making sure that it is perfectly level. Any low spot would lead to an over pour with the glass spilling over the lip of the mold. After removing the pattern I screen powdered glass into the mold. I use stencils and free hand drawings to add images to the surface. In this process there is no room for errors since nothing can be erased without disturbing the delicate mold. I usually prepare the drawings that float inside the casting (inclusions) the night before. They are meticulously laid out on a steel surface using crushed and powdered colored glass. Great care must be taken to ensure that the finished drawing will fit within the confines of the final casting. Since the images are frequently layered one on top of the other the final composition must also be carefully considered from the very beginning (example). At this point I am finally ready to bring in my team of assistants for the actual casting. Depending on the size of the piece, I work with a team of three to ten or even twelve people. First I pour a little glass onto the drawings on the steel. After a few moments when these have sufficiently cooled, I begin pouring glass into the larger mold. 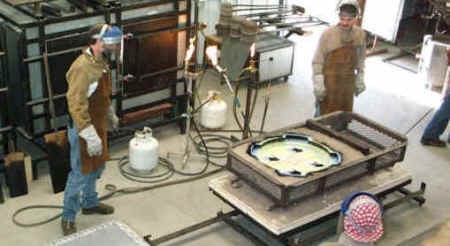 The smaller castings with the images are then laid into the larger casting between ladles of molten glass. 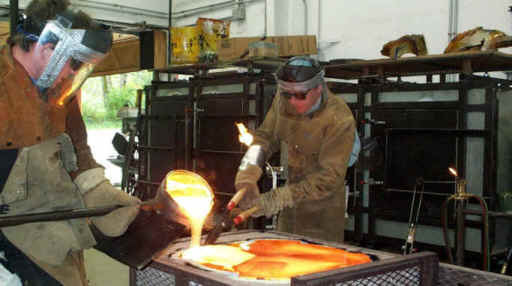 Since both the smaller and the larger castings are of the same glass, and everything happens hot and fast, they melt together with hardly a trace of separation (example). There is again no room for errors and no way to fix mistakes. 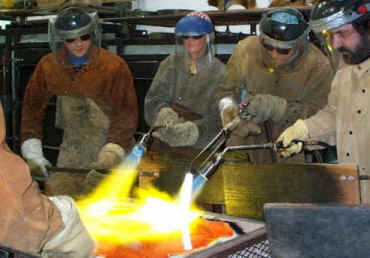 After literally hours of preparation the interaction with the molten glass takes only a few extremely exciting minutes. The team has to work like a finely tuned machine. For a large piece involving up to a dozen people we will frequently do a "dry run" to choreograph everybody’s movements and actions. This is a "team sport" that is not without personal risk. We pour the glass at close to 2300 degrees Fahrenheit, using steel ladles that weigh up to 25 ponds when empty. After the pour, while the casting is "setting up" we keep the top surface "warm" using propane torches with three to four foot long flames. After torching the casting for several minutes we move it to the annealing oven. Here the casting is cooled at a computer controlled rate from 930 degrees Fahrenheit to room temperature over a period of two to ten days depending on the thickness and mass of the glass.